A dental implant is a tooth root restoration that can be combined with a porcelain crown to create a perfect tooth replacement option for patients with missing teeth. Dental implants are created using a specific titanium alloy that can fuse to your jawbone the same way a regular tooth root can. This process is called osseointegration and allows your jawbone to stay healthy and strong. After your implant rod is placed by a specialist, the new tooth will be finished at our office with a dental crown or implant-supported denture appliance. Implant dentistry is a great option for patients who are missing teeth because it is the only option that restores both the tooth root and the tooth crown. This complete prosthetic tooth provides many benefits to the health of your complete mouth system. When you lose a tooth, the bone underneath the gum line can start to deteriorate without tooth root support. Dental implants provide the support your jawbone needs to stay healthy. With a dental implant, you may forget that you ever lost a tooth! Dental implants look, feel, and function like regular teeth. You’ll be able to enjoy all of the activities you enjoyed before your tooth loss and feel confident in your smile again. Dental implants are extremely durable and can last a long time. You can still have a lasting, beautiful smile, even if you’ve experienced tooth loss in the past. 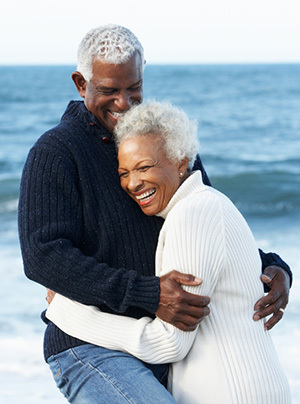 With proper care, your implant can last a lifetime. 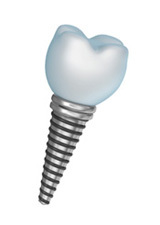 At our practice, we provide our patients with beautiful implant restorations. Using a porcelain dental crown, we can create a stunning tooth replacement that looks and feels great. Each of our restorations is made specifically for each patient and is personalized to meet their needs.